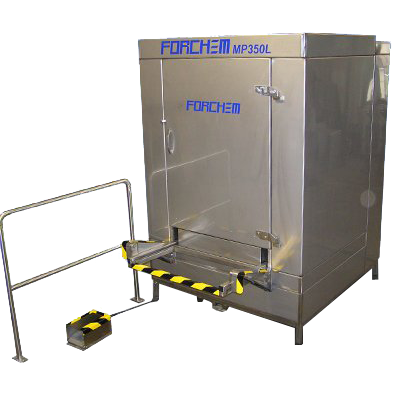 Crate washer FORCHEM MP 350 L is designed for cleaning dirty handling carts and laska carts used in the food industry. The quarantee of the cleaning quality are the high - tech hydraulic pump and a lot of nozzles situated in the cleaning tunnel. The whole crate washer is made from stainless steel. Addapting all factors which influence the cleaning process (especially the pressure, time, the quantity of cleaning agent and the temperature) can FORCHEM MP have always excellent performance. Easy service, not difficult maintenance and the long durability of our equipments are for us the important point of the customer satisfaction. With many new innovations it satisfy the highest customer requests and rankes the new quality standard. Its another benefit is easy accesible service.